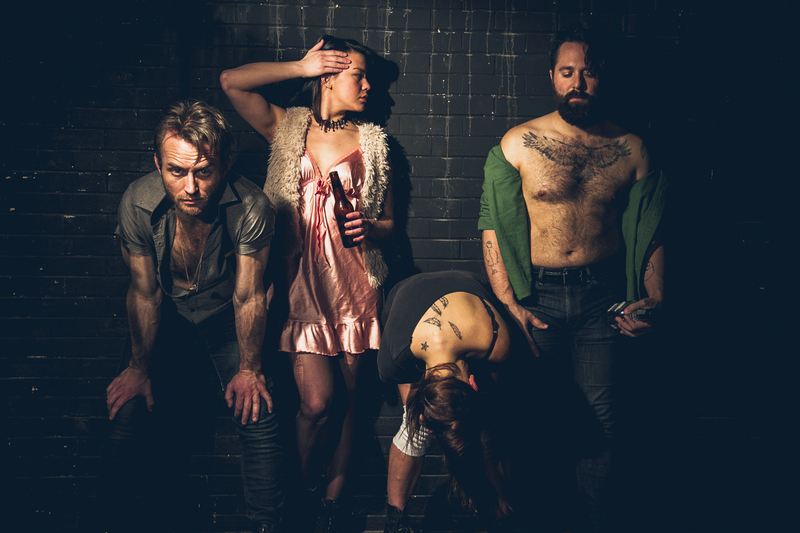 The Salts is the latest show put on by The Inconvenience, marking the first time that the ultra-hip multi-disciplinary performance collective has dedicated a full evening to dance. The work is devised by Erin Kilmurray, created in collaboration with actress/singer/clown Molly Brennan. The Salts is hidden in the Flat Iron Arts Building in a hard-to-find space on the third floor. I found the room by accidentally going through the backstage door, and then a nice young woman guided me around to the front. Once actually inside, it’s standing room only. It didn’t take me long to realize that this was no ordinary dance show (why would I expect anything but extra-ordinary from Erin Kilmurray and her dancers Mikey Rioux, Josh Anderson, and Katie Graves?). I thought I was set while listening to the opening band, She Speaks in Tongues, as the only audience member to grab a structural beam to lean against. As it turned out, I was way wrong about that. The Salts is in danced in the round, but the audience is in the middle and ever-present during the hour-long performance. Kilmurray’s choreography takes the dancers all over the room, bouncing between four mini-stages on the perimeter of the room, tearing up the floor in the “pit” with the audience, and moshing over top of us. With a raucous musical score compiled by Mikhail Fiksel, The Salts has one tone: loud. Respite only comes during brief periods of dialog as the dancers disclose little snippets of themselves breathlessly into microphones. We hear about Graves’ nostalgia for Chicago, Rioux’s temporary escape to Seattle, and Anderson’s skydiving adventure with a guy aptly named Ward Thunder. I knew enough about the individuals onstage to know that each of these monologues was partly, if not wholly true; like a radio announcer changing discs or a rockstar tuning his guitar, it strung together the loosely connected series of short dances. In truth, I’ve never seen dancers who were so perceived as rockstars by us, their adoring fans. Kilmurray said the show was “all about music, and dance, and this space,” and thankfully she was right. The whole thing was electrifying, and crazy, and yet refreshingly simple. I kept thinking that Kilmurray’s movement, set to music by Philip Glass and performed 100 feet away in pastel dance dresses could easily have been mistaken for any other dance company, but she has a keen ability to appeal to the masses (or at least to the hipsters) through uncomplicated choreography and an essence that oozes with cool. Personally, I felt quite uncomfortable, perhaps because I was wholly unprepared for what I was going to see. I was completely sober, and running late, and carrying a big bag that I couldn’t set down, and didn’t bring a guest, and I generally feel self-conscious in these sorts of settings anyway. In that moment that I walked into the room, I felt all of my insecurities intensely and would have preferred a more passive audience experience that allowed me to hide a little. Knowing that, there are plenty of people who shouldn’t go see The Salts – like sober people, people who like to sit down, people who can’t do strobe lights (you should probably post a disclaimer about that), and people who prefer not to be jostled or bumped or asked to participate or climbed over top of by sweaty dancers. Everybody else should definitely go. The Inconvenience presents ‘The Salts’ through May 30 at the Flat Iron Arts Building/Collaboraction, Room 300 (1579 N. Milwaukee Ave.) at 9:00pm. Tickets are $25, available online at https://www.artful.ly/the-inconvenience/store/events/5846.